Enhance your shower experience with additional storage, stability and seating options. Store and organize with style. 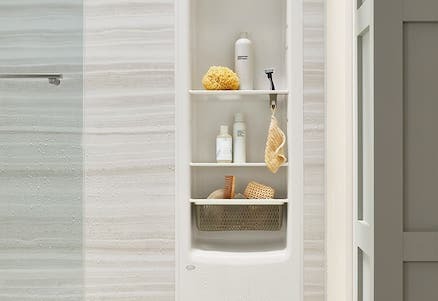 Once you’ve crafted the perfect KOHLER® LuxStone™ shower design, discover the thoughtful storage possibilities that maximize space and keep your new shower neat and organized. 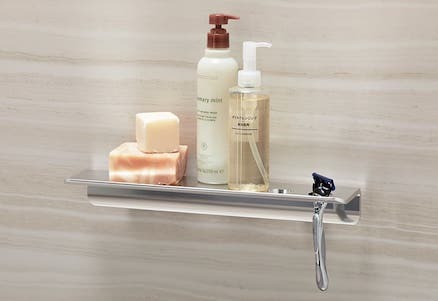 Kohler’s recessed shelving is an elegant space saver designed for tight quarters. The popular Shower Locker® storage, available in 9- and 14-inch widths, features four adjustable shelves and a basket for organizing unwieldy bottles and scrubs. This streamlined shower storage marries form and function with shelves and a basket that are height-adjustable to 10 positions; removable, easy-to-clean shelves; and an inset cup for toothbrushes and razors. This unique shower storage solution was designed to blend seamlessly with Kohler’s decorative shower walls and is available in the same colors to complete the look of your new shower. Combine the shelves with other useful accessories, such as the shower barre or floating shelf, for the perfectly personalized shower space. For extra storage, wherever you need it. 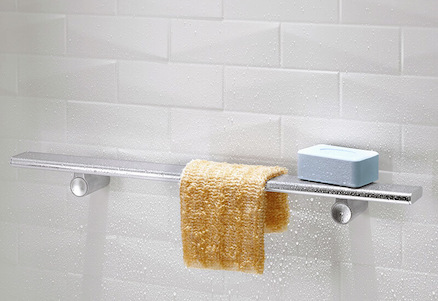 This adaptable shelf can be placed anywhere in the shower. You can even install it outside the shower to open up more storage possibilities. Made of durable anodized aluminum, the shelf is designed for quick water drainage and easy cleaning, and features a cleat system for simple, tool-free removal. Modeled after the graceful ballet barre. Available in 24" and 36"
Inspired by ballet dancers, this shower barre provides stability as you enter and exit the shower space. The polished design offers support for mobility assistance and everyday routines such as scrubbing feet, shaving legs or stretching. Made of anodized aluminum, the barre's slim, flat profile doubles as an extra storage space. The design effortlessly coordinates with both the LuxStone shower walls and Kohler faucets. Wash, scrub and shave in a comfortably seated position. Add flexibility and safety to your shower routine with this smooth, lightweight accessory. 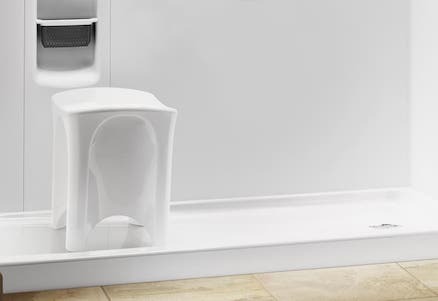 Perfect for resting your legs while you wash or shave, the one-piece moveable shower seat is lightweight and easy to clean. It’s sized to fit perfectly in any showering space and can be used outside the shower as well. Handles on the sides make it easy to move, and an ample seating area provides stability and comfort.